Have you ever wondered how the meets are scored, and how points for swimmers and teams are awarded? We're here to help. We've listed the order of events, and how the points are awarded for the various types of swim/dive meets. 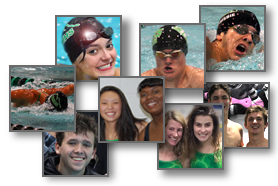 To obtain an invitation to attend the Cobb County and Georgia High School Association (GHSA) Meets, you must meet specific standards/times for each event. Diving is one of 12 events in a swim and dive meet. Diving is an individual event and the points are awarded as such. Meets can be one of two formats: 6 dives and 11 dives. Prior to a meet, divers will be informed as to which format the meet will follow. A dive is scored between zero and 10 points in either full or ½ -point increments by each judge. • Dual meets have a 1m 6-dive format. • The Cobb County Championship meet has a 1m 11-dive format. • The GHSA State Championship meet has a 1m 11-dive format. 10 Excellent - No visible flaws - Approach, hurdle, height, distance, execution and entry are all exceptional. 8.5 - 9.5 Very Good - Approach, hurdle, height and distance slightly affected. Execution well defined. 7.0 - 8.0 Good - Approach and hurdle unaffected. Height and distance acceptable. Execution defined, entry controlled, but slightly affected. 5.0 - 6.5 Satisfactory - Approach and hurdle acceptable. Height and distance adequate. Execution complete and entry slightly over or under. 2.5 - 4.5 Deficient - Approach and hurdle affected. Height and distance inadequate. Execution affected and entry over or under. 0.5 - 2.0 Unsatisfactory - Approach and hurdle affected. Height and distance inadequate. Execution not complete or broken position. Entry significantly affected. 0 Excellent - No visible flaws - Approach, hurdle, height, distance, execution and entry are all exceptional.